Home Tags Posts tagged with "shrimp"
This is one of my recurring ramblings: why do we see so little shellfish in Russian restaurants outside of Russia? Oh sure, you can have seafood fettuccine, lobster bisque, snails in garlic sauce, or softshell crabs at Tatiana or Volna in Brooklyn. Maybe even some shrimp cocktail and mussels vaguely marinières. But only in the lengthy salad section of the menu do you ever spot mussels, shrimp, and squid in dishes that actually looks like ethnic cuisine (if only because nobody likes non-lettuce salads as much as Russians do). 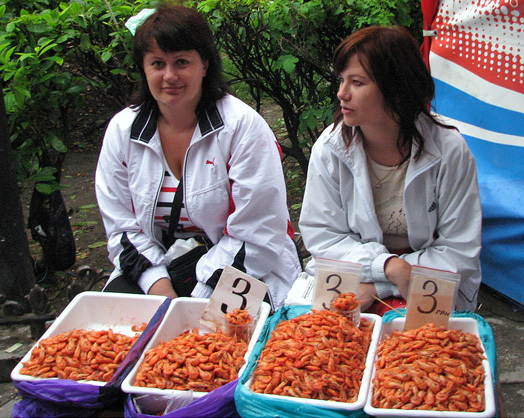 Yet there’s plenty of shellfish in Russia — or at least some! Just try to count how many seas the country’s got coasts on: the Baltic Sea, the Black Sea, the Caspian Sea, the Bering Sea, the Sea of Okhotsk, the Sea of Japan, plus a bunch of bodies of arctic water whose names nobody knows. Go to the Black Sea and despite the water’s low salinity, you’ll be served local mussels, shrimp, or Black Sea whelks. Just look at the menu of a place like Baran Rapan in Sochi, where half of the dishes are seafood: salads, shashlyks, soups, stews, pies, pasta, and more. Venture to the Far East, and it’s scallops, oysters, prawns, king crab, octopus, and (another type of) whelks. This is, after all, the Sea of Japan, the same sea whence Japan supplies its own seafood-heavy cuisine. Check out Ogonyok’s provenance-centric menu or Zuma’s simple “aquarium” seafood in Vladivostok. And yes, some of those places even offer shellfish platters. The aforementioned Zuma does. In Saint-Petersburg, Pryanosti i Radosti, for example, does too, even if I cannot confirm that any of it comes from the Baltic. Some places in Moscow probably do as well, but not being located by the sea, chances are they have French names, French chefs, and French seafood flown in daily (well, except for the current food ban), so that’s cheating. But platter options, in any case, remain scarce. Out in Brooklyn, they seem non-existent. Maybe you could order oysters, shrimp, and scallops separately, and transfer them to a single large plate? Don’t they realize — all those places that welcome you with faux chic decor, with tuxedoed waiters serving pseudo-classy dishes (such as Baku Palace and its fake crab) — that a simple shellfish platter would look more impressive, and turn more profit than, say, watermelon carvings or assortments of mayo-drenched appetizers? Or am I the only one to think so? The oysters and king crab legs hail from the Peter the Great Gulf (that, or the Long Island Sound plus Alaska). Just like at the local restaurants with their “aquariums”, I’m serving serving them au naturel. But the author of this blog doesn’t just throw some raw ingredients on the table and call it a recipe, no. The next tiers of the platter, coming from the Black Sea, require a little bit more work. During my trips, I remember seeing restaurant menus listing dishes like mussels baked in their shells with cheese and mayonnaise; julienne of mussels, squid, and shrimp in cream sauce with cheese and mushrooms; and the famous salads, as usual. I’m creating my own salad, and keeping the baked mussels, to preserve the two oh-so-Soviet seafood-cheese and everything-mayo combos. Then I make cute little bamboo skewers of shrimp and mussels, the former infused with tea, the latter flash-smoked with the Smoking Gun, for a post-Soviet update. Finally, there’s the caviar, representing the Caspian of course (that, or Tennessee). I know, caviar doesn’t exactly count as shellfish, fish roe doesn’t have shells, etc., but hey. Having prepared the plateau without first fully investigating the latest options offered in restaurants in Russia, I have some regrets now… Should I have included an adaptation of Ogonyok’s scallops with lemongrass and garlic scapes? A whelk shashlyk inspired by Baran Rapan? Fake crab drowned in Hellmann’s mayo? Rinse the mussels under cold water. If a shell is open and doesn’t stay shut when you pinch it, the mussel is dead and you should discard it (where I live, this happens way more often than it should). Place the mussels, white wine, parsley, and shallot in a large pot. Cover with a lid, and cook over medium heat, shaking the pot regularly, until all the mussels have opened. Take the mussels out of the pot. Keep some mussels on the half shell for the baked mussels below. Pick the rest out of their shells, let cool, and refrigerate. Strain the cooking liquid in a chinois, let cool, and refrigerate (we’ll only use a tiny bit of it in the mayo). Heat the water to 95 C / 205 F using your favorite kitchen gadget (kettle, saucepan, microwave…). Stir in the tea leaves, and let steep for 10 minutes. Strain the tea, discarding the tea leaves. Season the shrimp generously with salt. Sauté in a hot pan with canola oil until the shrimp are slightly colored on both sides. Add the tea, and simmer for a few minutes, until the shrimp are cooked throughout. Let rest in the pan for about 10 minutes, then transfer to a container and reserve. Season the squid tentacles and bodies with salt and pepper. Heat a pan over high heat with a thin layer of olive oil, add the tentacles — spread out — and sauté until brown on all sides. Let cool. Cut the conical squid bodies into halves, like flat triangles, and use the tip of a knife to make some crossmarks on the outsides. Heat a pan over high heat with a little bit of olive oil. Sauté the bodies crossmarks-down until just colored. The squid should be tender and just starting to curl. Let cool. In a bowl, mix the egg yolk, mustard, lemon juice, mussel cooking liquid (or water), salt, and piment d’espelette. Optionally, sprinkle the xanthan gum while still mixing. Slowly dribble in the oil, and whisk until the mayo is thick and the oil is incorporated. Keep pouring the oil in a thin stream while whisking. Cover with plastic wrap, and refrigerate. In a bowl, toss the bread with the olive oil. Transfer to a sheet tray lined with parchment paper, and toast in a 225 C / 450 F oven until brown. Let cool. In a small saucepan filled with salted water, boil the potatoes until cooked, then drain and let cool. Slice the potatoes. Cut the cooked shrimp into large dice. Cut the squid bodies into thinner strips, but keep the tentacles whole. In a bowl, toss the potatoes, shrimp, squid, tomato, olives, croutons, mayo, and parsley. Rectify the seasoning with salt and pepper. Refrigerate. Stick the mussels onto short bamboo skewers, 4-5 mussels each, and transfer the skewers to a quart container. Using a Smoking Gun, fill the quart container with smoke, close with a lid, and let sit for 1 1/2 minutes. Open the container to let the smoke out, then close again and refrigerate. Stick the shrimp onto short bamboo skewers, 2 shrimp each. In a bowl, mix the mayo and the grated cheese. Spoon the mixture onto the mussels. Don’t put too much if you don’t want to completely overpower the mussels — it’s OK if you have some mixture left. Transfer the mussels to an oven-safe dish, and bake in a 175 C / 350 F oven for about 10 minutes, until the cheese is completely melted. Don’t try to brown the cheese, as this will break the mayo and you’ll end up with a greasy mess (as I did on my first attempt). Sprinkle with chives, and proceed with assembly immediately (ideally, you should start the assembly while the mussels are baking). Using kitchen scissors, cut the shells of each crab leg lengthwise twice, so that the meat can be easily picked out by the diners. Using an oyster knife and the usual precautions, shuck the oysters, keeping the liquor in the shells. Arrange all the elements on a seafood tray to your liking. For example, place the crab legs, oysters, and lemon wedges together on ice; have the shrimp and squid salad and a tin of caviar together; the skewered shrimp, skewered mussels, and baked mussels can form another tier, which doesn’t need to be chilled. Spoon the mayo, butter, and crème fraîche in ramekins, and distribute where they fit. Serve with assorted breads and bagels. Here’s another recipe made with seafood that can be found in Crimea: skate, shrimp, and mussels. 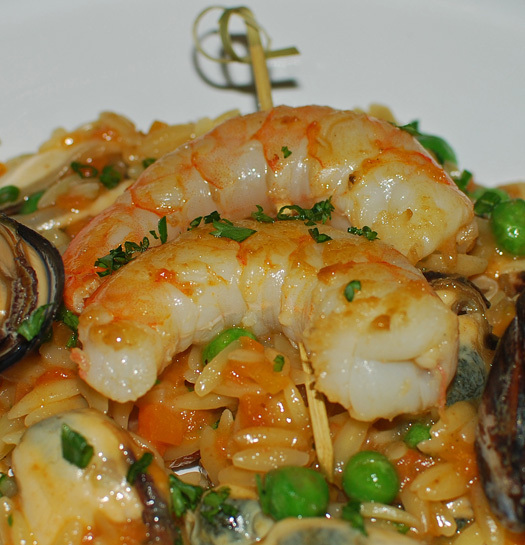 (See also my Crimean Seafood Orzo). Following Ukrainian cuisine’s propensity for all things ground, the fish and the shrimp are minced to form nice little round patties. 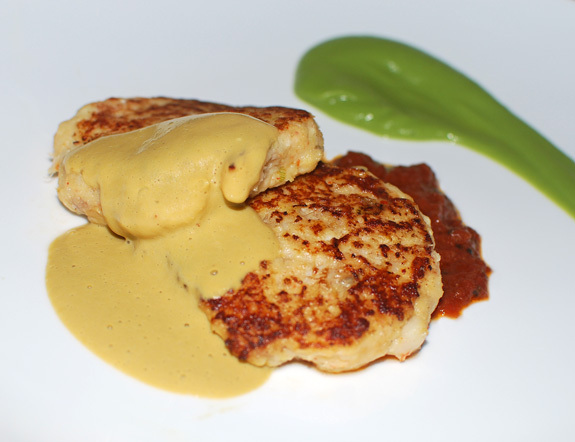 The vibrantly yellow mussel sabayon packs a lot of bivalve flavor which complements the fishcakes perfectly. I serve the dish with a mix of spring vegetables. Bring a pot of water to a boil. Make cross marks in the tomatoes with a knife, blanch for 30 seconds, then shock in a bowl of ice water. Peel, core and seed the tomatoes. Roughly chop the flesh and reserve (you should have about 470 g of flesh). Place the seeds and membranes with the salt into a conical sieve over a bowl, and leave for 30 minutes. Mash the contents of the sieve a few times, then discard. Reserve the tomato liquid. Heat the olive oil in a saucepan over medium heat. Stir in the star anise and nutmeg. Add the tomato flesh, tomato liquid, Worcestershire sauce and ketchup, then cook over low heat for 2 hours, stirring occasionally. Let cool and reserve. Reheat in a small saucepan just before serving. Clean and rinse the mussels under cold water. 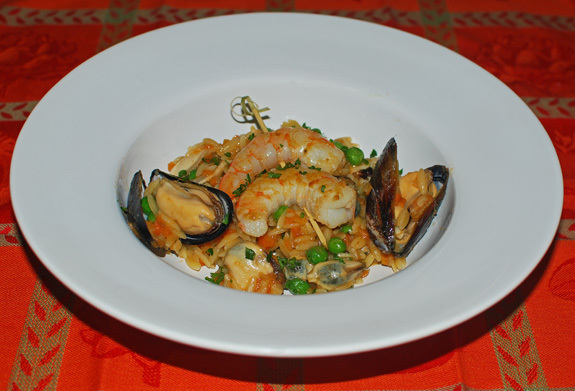 Place the mussels and shrimp shells in a pot with the white wine, onion, spring onion stems and saffron. Cover with a lid and cook over high heat until all the mussels are open, shaking the pot regularly. Let cool for 5 minutes. Remove the mussels from their shells, let cool and refrigerate. Pass the cooking liquid through a chinois and reserve. Season the skate with salt, and sauté in a hot pan with 1/3 of the butter until golden-brown on both sides. Let cool and reserve. Sauté the spring onion with the rest of the butter in the same pan over medium heat, season with salt and cook until soft. Let cool and reserve. Quarter the potatoes, place in a saucepan with cold water and salt, and cook over medium heat until tender. Pass though a food mill using the finest grate, let cool and reserve (you should have about 200 g of potato purée). Chop the shrimp very finely and place into a bowl. Shred the skate into the bowl, then add the beaten egg and egg yolk followed by the orange juice, piment d’espelette, spring onion and potato purée. Mix with a rubber spatula just enough to blend all the ingredients. Refrigerate for at least 1 hour. Shape the mixture into 8 cakes of 8 cm diameter (about 88 g each). Dredge the cakes in flour. In a non-stick pan oven medium heat, sauté each cake with a small piece of butter until brown on both sides. Transfer the cakes to an oven-proof dish, and cover with foil. Before serving, finish in a 175 C / 350 F oven for about 10 minutes. Process the mussel juice and 55 g of the mussels in a blender until smooth. Pass through a chinois, and transfer to a double-boiler. Whisk in the egg yolks, and cook the mixture to a ribbon consistency, stirring constantly. Remove from the heat, mix in the butter and crème fraîche, add the remaining mussels, and serve immediately. Blanch the sugar snap peas in salted boiling water, drain, then shock in a bowl of cold water. Coarsely chop the peas on a bias. In a pan over medium heat, sauté the zucchini with the olive oil for a couple minutes. Season with salt and pepper, add the scallion whites, and cook until soft. Add the sugar snap peas, scallion greens, and lemon zest. Rectify the seasoning, stir for a minute, then serve. I wanted to make a dish that shows the potential of Crimean seafood, a recipe that would be to Ukrainian cuisine what Artic Char Vojvodina is to Serbian cuisine. The tomato-carrot sauce is inspired by Heston Blumenthal’s tomato compote. This is the longest part of the recipe, but it’s well worth the trouble. You could prepare a large batch in advance, keep some in the refrigerator for a few days and freeze the rest. The rest of the recipe can be completed in about 30 minutes. Bring a pot of water to a boil. Make cross marks in the tomatoes with a knife, blanch for 30 seconds, then shock in a bowl of ice water. Peel, core and seed the tomatoes. Roughly chop the flesh and reserve. Place the seeds and membranes with the salt into a conical sieve over a bowl, and leave for 30 minutes. Push the contents of the sieve with a ladle a few times, then discard. Reserve the tomato liquid. Heat the olive oil in a saucepan over medium heat. Add the onion and carrot, and cook for about 10 minutes until soft. Stir in the coriander, star anise and nutmeg. Add the tomato flesh, tomato liquid, Tabasco sauce, Worcestershire sauce, ketchup and thyme, then cook over low heat for 2 hours, stirring occasionally. Reserve. Peel the shrimp and reserve the shells. Keep 8 shrimp whole and cut the remaining ones in half. Season with salt and sauté in a hot pan with olive oil until brown on all sides. Remove from heat and reserve. Place the shrimp shells, mussels, white wine, onion and chives in a pot. Cover with a lid and cook over high heat until all the mussels are open, stirring regularly. Let cool for 5 minutes. Keep 8 mussels whole, pick the others from their shells, and reserve. Pass the cooking liquid through a chinois and reserve. In a saucepan, melt half of the butter over medium heat, add the orzo, and stir for a minute. Add half of the mussel cooking liquid and bring to a simmer. Cover with a lid and cook over low heat until all the liquid is absorbed. Repeat with the rest of the liquid. Add the green peas, the cooked shrimp and mussels, the rest of the butter, half of the chives and parsley, and enough water to finish cooking the orzo. Cook uncovered over low heat, stirring regularly. Serve the orzo in a bowl, top with the whole shrimp on bamboo skewers, and sprinkle with the remaining chives and parsley.